Could Google TV get its Kindle Fire moment? Google (s GOOG) started to distribute version 2.0 of its Google TV software this past weekend. 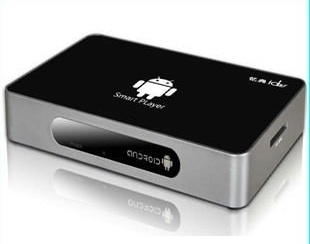 One feature of the new version hasn’t gotten much press yet, even though it could be key for the future of both Google TV and the connected TV space in general: Google TV users will be able to install non-market apps, just like they can on any Android mobile phone. That could not only lead to separate app markets, but eventually also to Android-powered CE devices that have little to do with Google’s platform at all. Think Kindle Fire, but for your television. 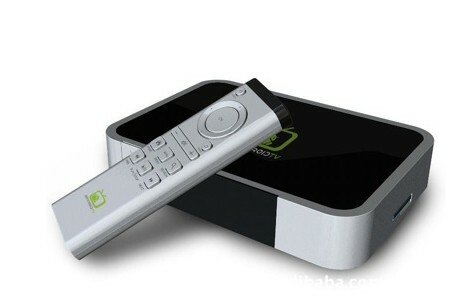 One of countless Android TV boxes currently available on Alibaba.com. Well, guess what? These copycat innovators are already in the TV space. A quick search on Alibaba unearths dozens of Android TV devices, usually priced around $100, promising Android 2.2 and various apps. It’s a safe bet than none of those will have legitimate access to the Android Market, but just like those early tablets, they’re going to figure out a way to make it work. Google officially introduced Honeycomb-powered Android tablets this spring, and since then, we’ve seen a number of devices from major vendors like Samsung, Asus, Motorola (s mmi) and Dell. (s DELL) Most of these don’t seem to sell all that well because they have to compete with the iPad, but they obviously all have Market access and offer the real deal. Early on, the number of apps optimized for these devices was very limited. But just a few months later, there are already plenty of Honeycomb apps. Fast forward a few months, and we are going to see a similar situation for Google TV devices. Well, they may actually sell better with the new OS as they’re not facing off against an iPad-like competitor, but still, 2012 will bring us Google TV devices from at least four major vendors, and I wouldn’t be surprised if even more companies joined the party. As a result, we’ll see many developers flock to Google TV as well. 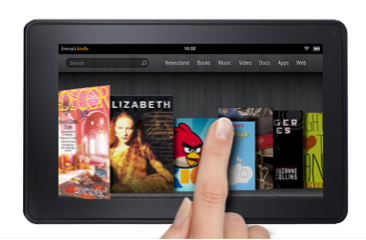 Amazon’s (s AMZN) Kindle Fire is the first big fork of Google’s Android platform. The underlying code is all Android, but the UI is completely different, and it doesn’t offer access to the Android Market, much like the early copycat tablets. Of course, Amazon can easily make up for this omission with its own Android app store. Did I mention it’s cheap? I think there very same thing could happen to Google TV. There are countless Internet media player devices from companies such as Boxee, Roku, Netgear, (s NTGR) WD, (s WDC) Seagate (s stx) and others out there. Some may have good reasons to continue the development of their own platform. Boxee, for example, is getting much of its code from the XBMC open-source project. But others may eventually decide it’s too much of a hassle to keep reinventing the wheel, especially when consumers start demanding things like a browser with Flash (s adbe) capability on their devices. So why not simply go Android? Problem is, Google has pretty stringent requirements for Google TV hardware makers. The platform is expected to support ARM chips, (s armh) which should lower the price point of the device hardware. But manufacturers will still need to include plenty of RAM, the capability to work with a video feed from a cable box, as well as a full QWERTY keyboard to get Google’s seal of approval — all of which could significantly bring up the price of a set-top-box. That’s why I predict that we will eventually see one of the WDs or Netgears of the connected TV space switch to an Android code base, but without access to the Google TV ecosystem. It will be a box with a full browser, plenty of apps and access to a separate app market: the Kindle Fire of the living room. I’ve talked with Google TV execs about this issue, and they seem to be at least aware of the possibility that something like this could happen. Should Google care? Consumers could obviously be confused by a number of different Android TV platforms, and developers could be frustrated if their devices run on one device but not another. That’s something Google is acutely aware of, based on the painful experiences it had early on in the handset space. “The most important thing is to prevent fragmentation,” Google TV VP of Product Mario Queiroz told me ahead of the launch of the new version. Google TV may look different as hardware partners give their respective devices their own look and feel, but we can expect Google will keep them much more in check to avoid fragmentation issues. That of course still leaves implementations without Google’s blessing. It’s too early to say whether the Kindle Fire will help or hurt Android tablet sales, but one could argue that for Google, anything that gets developers and consumers to use Android over iOS is good. The same may one day be true in the TV space, in which case a Kindle Fire-like, set top-box may not look like Google TV at all, but still help Google to succeed in the living room. Hear more about innovation in the TV space and the trends that will impact the connected consumer at the GigaOm RoadMap conference, coming to San Francisco on November 10. None of these STB’s matter until the unholy marriage of content creators and cable providers is dissolved. I don’t want a stupid box that goes between my cable box and my TV. I want something that completely replaces the cable box by giving me access to streaming online content (real content from top-notch creators) and my networked content. No stupid codec restrictions. No more of this, “you get Neflix but not Amazon VOD, you get ABC but not CBS, you get HBO but only if you have cable in the first place” bull. Seriously, we need to execute cable as we know it and go to an a la carte system that rewards good content and lets the stuff on channel 528 die. I know, bandwidth, yada, yada, yada. The only situations where we’ve seen success with non-Google Android forks is where the OEM has something significant to leverage and little to gain from Google as a partner. Examples include B&N Nook, Kindle Fire, OPhone, and Baidu. But I think the number of such cases is quite limited. Google, of course, has a huge incentive to make it as attractive as possible for OEMs to be their partner and provide the full Android experience. Sounds amazing, looks amazing, I also want one and I cant wait to see how these get on! Hah! Thanks for pointing it out, I corrected it. Interesting thoughts. I’ve seen several Android STBs in the flesh and they vary wildly in quality, and the ability to render web video. On the whole, the Android 2.2 boxes are almost always poor. Bad browsers for the most part. The 2.3 boxes were on the whole much better and crucially tend to have proper full web browsing, rendering and streaming capability. Some of the problem with the 2.2 boxes is that manufacturers are just taking what is basically a BSP from the semi co and putting a STB case around it. So while Google continues its Android business model there will be STBs running it – no question. The UX will of course diverge, as it did with handsets, until Google decide to pull it back together, but they will need an alternative to GoogleTV as that unified UX. I just want them to use powerful ARM chips already, like the quad core Tegra 3, and try to turn Google TV into a console platform, that a lot of manufacturers can use to push their cheap “consoles” into the market. But Google needs to really push that idea to developers, too. They need a hands-on approach with this, and not treat it as an afterthought. Google gets plenty out of it – when people open the browser and search for something whose ads do you think they are going to see? And Android is open source, so Google set it free for people to do whatever they want with it – including this! Most especially this. Getting the full Android Market and apps on these will no doubt be a pain, but no doubt also it can be done. Want one. Or maybe six. If they’re not official Google versions, Google should be concerned because they get absolutely nothing out of it – If it’s not an official Google version is it really even “Android”? It’s certainly not in consumers minds. It’s just an embedded system of some kind just like in many products. These (including Fire) probably shouldn’t even be included in android market share numbers. These are somewhat like Unix – It’s in a lot of things but the various flavors are reported separately. OSX is not clumped with Linus or BSD, etc. Android is fragmenting into the same type of thing. Google doesn’t get a whole lot from the Android Market either. 70% goes to the developer. 30% goes to the carrier. Google didn’t build Android to profit directly from it, but indirectly. By advancing technologies so that everyone is carrying a web browser in their pockets or have web browsers on their televisions, the web gets used more and more. The more the web gets used, the more Google earns through advertising. If people use apps more than browsing the web, then there will be more and more app developers. These app developers will want to monetize their apps with in-app payments or will want to advertise their apps. In this ecosystem, Google makes money via advertising and the payment processing fees. So, really, even if there’s an Amazon TV device like Kindle Fire which doesn’t connect to the Android Marketplace, Google will still profit from it in the long run. So why not a Kindle Fire TV box?